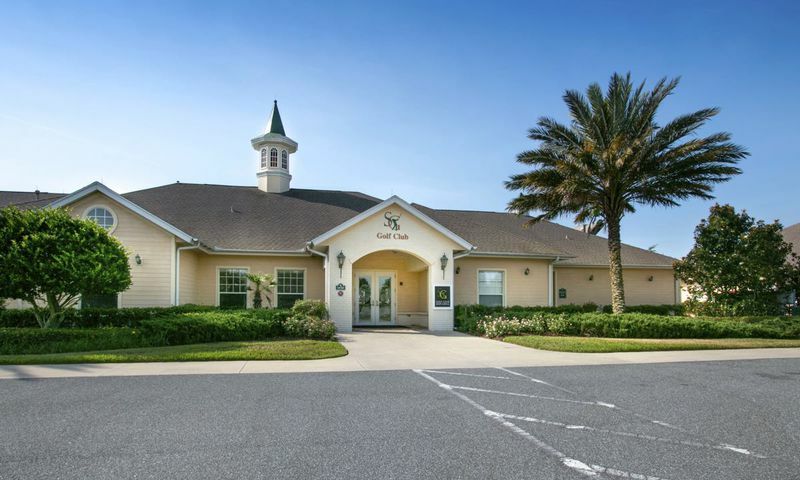 SummerGlen by Florida Leisure Communities is a gated, active adult community in Ocala, Florida. This affordable golf course community, where country charm meets city convenience, is just one Interstate exit away from in-town Ocala. What makes SummerGlen different from other Florida golf retirement communities is that it provides an uncrowded and relaxed golfing experience. The Town Center at SummerGlen includes a golf clubhouse, Residents' Club and Grand Hall. SummerGlen prides itself on being a more intimate community, and much socializing takes place in all three areas. Not only is the SummerGlen Town Center open for residents to enjoy a wide array of activities and events, but they can also bring guests. The SummerGlen Residents' Club sets the stage for active fun, fitness, and friendship. It features a library, billiards, and multiple rooms for pottery, arts and crafts, sewing, and card games. A fully-equipped fitness and aerobics center are perfectly complimented by an outdoor pool and spa, for water aerobics and swimming, or just relaxing. The adjacent Grand Hall hosts bigger community gatherings, parties, dances, and special events. The covered veranda and sunny pool deck offer lots of room to relax with friends and neighbors. There is also an on-site restaurant located in the Golf Club. SummerGlen Grill offers breakfast, lunch, and dinner. SummerGlen residents can enjoy dining inside, outside in the screened, covered lanai, or opt for carry-out. Winding through the community is the SummerGlen Golf Club. This 18-hole course boasts well-manicured greens and open fairways dotted by towering oak trees. It presents an exciting challenge for golfers of all skill levels. Florida Leisure Communities started construction of SummerGlen in 2004 and completed the community in 2014 with 1,029 single-family homes. Today, homebuyers can choose from great homes available on a resale-only basis. The Arbor Cottage Series offered six models ranging from 1,377 to 1,930 square feet of living space with two to three bedrooms, two bathrooms, and an attached two-car garage. The Designer Series homes range from 1,377 to 1,810 square feet of living space with two to three bedrooms, two bathrooms, and an attached garage. Lastly, the Signature Series homes range between 1,558 and 2,575 square feet of living space. These models offer two to four bedrooms, two to three bedrooms, and an attached garage. All models were built with active adults in mind offering single-floor living with open floor plans and great low-maintenance exteriors. Since SummerGlen will remain a smaller active adult community, residents 55 and better can enjoy an intimate lifestyle. There are also a multitude of clubs for participation: Bible study, Canasta, weight watching, Bingo, painting, Bridge, drawing, line dancing, Mah Jongg, gourmet club, quilting, singles club, stenciling, poker, and money management. SummerGlen also has scheduled activities, such as lunch outings, game nights, and pot lucks. Residents are able to enjoy all the great activities and amenities inside this great community as they bask in a low-maintenance lifestyle. An annual homeowners' association fee covers general maintenance of the community grounds a well as the lawn care and curb side trash removal of all homes in the community. Not having to worry about tedious chores allows residents to spend more time with friends and family. Ocala, Florida is about 15 to 20 minutes away from SummerGlen, offering great shopping and restaurants. Ocala also provides year round theater performances, concerts, public festivals, dance recitals, and special museum exhibits. For additional recreation, Silver Springs Park offers glass bottom boat rides. Horse lovers will enjoy rodeos, tractor pulls, and 4H shows at the Florida Horse Park - a mere ten minutes away from SummerGlen. Orlando, about 90 minutes away, makes a great destination when grandchildren come to visit. Disney World, Sea World, and Universal Studios are sure to entertain the young at heart as well. For long distance travel or family visits, the major airports at Tampa and Orlando are easily accessible. SummerGlen offers plenty of amenities and attractions close by that are perfect for active adult homebuyers. There are plenty of activities available in SummerGlen. Here is a sample of some of the clubs, activities and classes offered here. Arbor Cottage Series offered six models ranging from 1,377 to 1,930 square feet of living space with two to three bedrooms, two bathrooms, and an attached two-car garage. These cozy homes offer great designs and low-maintenance exteriors. Designer Series homes range from 1,377 to 1,810 square feet of living space with two to three bedrooms, two bathrooms, and an attached garage. These homes were designed for active adults with low-maintenance exteriors and open floor plans. Signature Series homes range between 1,558 and 2,575 square feet of living space. These models offer two to four bedrooms, two to three bathrooms, and an attached garage. Residents love these homes for their single-floor living and open floor plans. We love it here. We are not retired but wanted to live in Florida in a 55+ community. Summerglen is the perfect fit. Not too huge and crazy and not too small. The amenities are terriffic. The fact that I don't have to mow my lawn is a huge plus! We are so close to great biking trails and it is only a quick trip to Ocala or down to The Villages. I can't think of anywhere else where a trip to Walmart takes you thru ranches and fields filled with cattle and horses. It is just absolutely beautiful here. It is great to be close to all shopping but not in the craziness of traffic! We are extremely happy we purchased a home in Summerglen. You will not find a friendly and more activity community. We looked for 4 years and found this hidden 'gem'. We are close to everything but in a country-setting. Every day brings a new venture. So many clubs and activities. My calendar is always filled. However, you can relax and sit at the pool all day and night, Great restaurant on site and a 18 hole golf course at your pleasure. Smaller community with only 1024 homes but big enough to have lots of people to have many clubs and activities. Own softball diamond, tennis courts, pickleball courts, basketball court, and even plots of land for your own garden. On site entertainment provided by many of the clubs at SummerGlen. GREAT FUN! I have always been frugal and smart with my money. SummerGlen is a great community with nice homes and nice amenities at even nicer prices. You probably won't be able to find a nice, gated community around Ocala with so many amenities where you can get a great home for well under $200k. I looked, a lot! I am a SummerGlen resident. I love the golfing and softball activities we have here at Summerglen. My wife and I are very happy we chose to live here. It is a great place to live the retirement life. 55places.com is not affiliated with the developer(s) or homeowners association of SummerGlen. The information you submit is distributed to a 55places.com Partner Agent, who is a licensed real estate agent. The information regarding SummerGlen has not been verified or approved by the developer or homeowners association. Please verify all information prior to purchasing. 55places.com is not responsible for any errors regarding the information displayed on this website.